July 25th has been designated an international day of solidarity with antifascist prisoners. If you’d like to join in, the simplest ways to show solidarity from the UK would probably be to write to Yusef, who was jailed for resisting racists who attacked a demo in Cardiff a few years back, or message Merseyside AFN to get the address details for their comrade who was recently jailed, and/or to donate to their prisoner support fund here. You might also want to contact the Swedish prisoner support group Föreningen Fånggruppen at foreningenfanggruppen[at]gmail[. ]com to get the addresses of the Swedish comrades who’ve just been sent down for a demonstration in Stockholm in 2014. In both cases, those involved have decided not to make their addresses fully public, so please be careful about sharing any information you’re given, and don’t be surprised if they want to check who they are before telling you anything. Looking ahead, you could also look at this list of suggestions for ways to support the upcoming national prison strike in the US that’s planned for September, and think if there’s anything you and your friends can usefully do to show international solidarity with the movement. And looking further ahead still, it’s worth thinking about what you can do to raise awareness of the case of Aiden Aslin, who’s still potentially facing terrorism charges for allegedly joining the Kurdish resistance against ISIS, and has his next bail date in Nottingham on October 19th. July 25th, 2016 marks the second annual International Day of Solidarity with Antifascist Prisoners. Last year antifascists around the globe participated in a variety of ways in an inspirational and powerful show of solidarity. 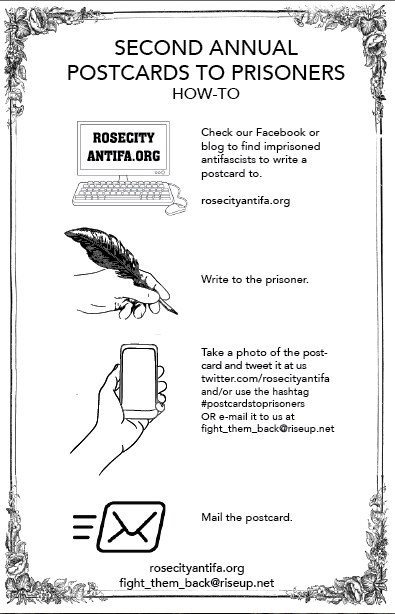 Rose City Antifa will again be doing the Postcards To Prisoners campaign, this time for the whole month of July. We are kicking things off with a benefit show at Anarres Infoshop this Friday July 1st. We will also be collaborating with Portland ABC to co-sponsor a benefit show on Saturday July 30th at Black Water. Proceeds from these shows will be going to the medical bills and legal defense of comrades that fought against the Traditionalist Workers Party and Golden State Skinheads in Sacramento last Sunday. If you can make it to either show, we will have an area set up with all the necessary supplies (postcards, stamps, names/addresses of prisoners, and information) for you to easily participate in the #postcardstoprisoners campaign! 3. Send or tweet us your pictures using the hashtag #PostcardsToPrisoners. We will compile photos and post them up on our Facebook page and twitter @Rose City Antifa. This entry was posted in Racism, Repression and tagged Aiden Aslin, anti-fascism, antifa, July 25, Michelle Smith, prison solidarity, prisoner support, Yusef Asad. Bookmark the permalink.